Okay, so I've nicked the idea John made popular around here - I did say I would get round to trying it one day. I've tried to add a personal touch and some originality with the shapes & lines. Took a lot of work to get to what you see here. Lit by 2 halogen desk lamps, shooting through a transparent/translucent chess board onto printed black & white checkers beneath. 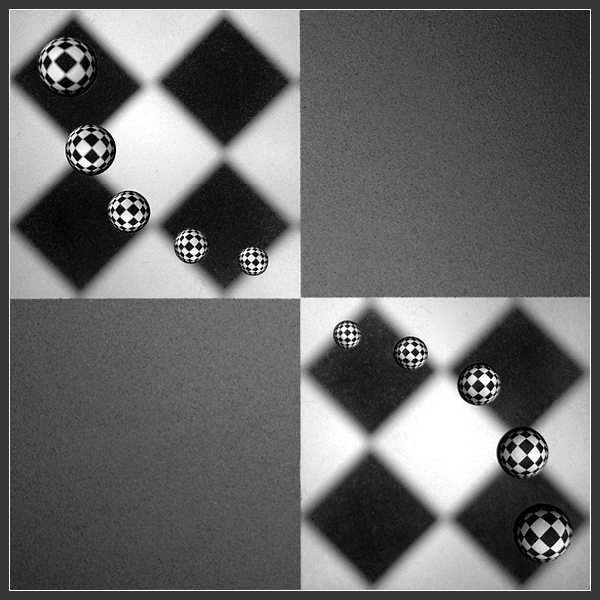 The 'noise' in the shot is caused by the glass of the chessboard. Hey Bod, you're right. You use the technique with an original flair. Very cool! CC: Oh yay I get to critque this beauty. I have already left you a comment previously, however as a member of the cc club, it is my pleasure to critique your photo again. What drew me to your photo was the black and white squares. I think that the way you have used the chess board for the white squares is absolutely brilliant and very eye catching. The water/droplets adds a very nice touch also. I like how both white squares are a duplicate of each other and compliment the photo in a very creative manner. The composition and use of black and white really is quite unique. I'm not a pro when it comes to the technicallity of photographs, however I see that the black squares from the chess board (dof) is brilliant. It's not to overpowering. The clarity of the droplets is also amazing. You mentioned the use of shapes and lines which is obvious here and works in well with the image that you created. It is a nice combination, and balances well. It is a pitty about the 'noise' however it's just a minor setback. I see that this picture took a lot of time and effort and the results speak for itself. Your photo would compliment photography in an art gallery. Again an excellent structure of tone, texture and of course clarity. Well done and is proof of a brilliant photo. WELL DONE!! Excellent shot! You deserved higher! This was my favorite of the week, tough luck for not winning mate! The difference between this one and all the rest that have used this technique is phenomenal. I love the symmetry and just... everything about it. I like dark bold photos though, and that's what you've got! Message edited by author 2003-02-03 03:30:27. Cute composition. Good job on the focus. Jacko. Interesting shot - would like to know how this was done. Like the composition and focus. Think it would also look need with just the bottom right square as the composition. Good job! I love the ethereal feel and the symmetry of your picture. Very unique. One of my favorites this week. Love the rhythm of the ball wave against the play of PS(?) squares. The B&W is an excellent choice. No need to add color here as there is plenty of visual action happening. The balls are charming jewels of fascination in themselves. Good job. Very elegant (bw) and graceful (curve fo the bubbles/balls). Nicely done. What is it. I can't but I like it. B&W was the right choice here. according to the version of the dictionary that I checked, harlequin is not a good title for this photo. I did give you a good score because I thought it was interesting. This is excellent. I don't know how you did it but I am looking forward to the explanation. 8 from me. Nice effect but the spheres are a bit over the top. very nice shot, but this technique has been reused far too often to award a higher score. i like it a lot though. Proudly hosted by Sargasso Networks. Current Server Time: 04/20/2019 01:00:20 AM EDT.